Engelbert Strauss is the leading European mail order business for work wear and personal protective equipment, with its headquarters in Germany. The company works with a worldwide network of manufacturers, designers and technicians in order to develop practical products for trade and industry, but also makes high-quality sporty and casual wear. For its Spring Summer 2013 engelbert strauss has brought a colour injection to its range with the new Colour World collection: bright lagoon, powerful nectarine and sunny citrus are the new shades, perfect for creating new original styles. The existing collections are now liven up by new fashionable patterns and trendy colours. Shirts, belts, shoes, shorts and caps have been redesigned for an everyday yet distinctive look. 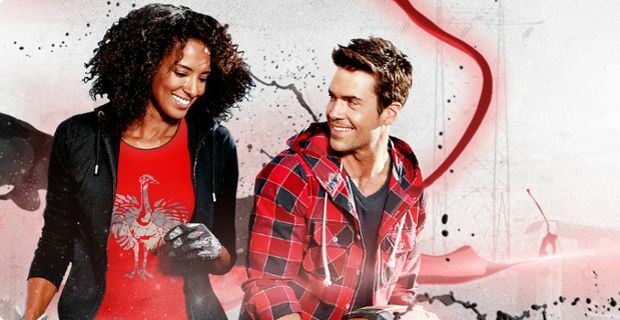 Engelbert Strauss Vision collection now includes even more products, such as shorts, T-shirts and trousers in new colours for men, women and children, to create a comfortable, practical sporty look. The worker style doesn't need to be boring and plain, by combining these items with the dazzling effects of the "Spider" and "Italy" collections anyone can achieve a cutting edge look, whatever the occasion. Engelbert Strauss motion trousers for the summer: Made of very light, breathable material, this cargo-style shorts have lots of pockets, versatile cut with straight leg and Flexbelt® waistband with stretch sides. They are softly napped on the inside for comfort and features button fastening with concealed zip. Engelbert Strauss T-Shirt work: Casual style T-shirt, two-colour print in ”used look“ available in cool new shades, like black, aqua and cement, black, cobalt and red, and black, hazelnut and lime. Made of soft, highly elastic material. Engelbert Strauss Ladies' Shirt Orlando: Lightweight check shirt in fresh colours - sapphire/citrus/white, lagoon/white/cement/limette and nectarine/stone/peat/white. Tailored cut, but still with a relaxed fit. The white seams and the attached breast pockets give this shirt a modern look. Engelbert Strauss cap motion: Thanks to the internal FlexFit® elastic band, this cap always sits perfectly and comfortably on your head. Rigid peak with embroidered motif and trendy print at the front. Airy mesh at the back for optimum ventilation. Engelbert Strauss soft hoody Italy: Hooded jacket available in cement/lagoon/black/white or black/royal/white, with slightly silky sheen and sporty racing stripes, deep side pockets with zip, hood with drawstring, volume-regulating and elasticated waistband. Perfect for water sports or for a walk on the Italian riviera. Engelbert Strauss children‘s soft hoody Italy: Put on and feel good: Pleasantly lightweight hooded jacket in the 'Italy' stripe design available in black/tangerine/red/white, black/royal/white, cement/lagoon/black/white. Fitted with two side pockets, sturdy zips and elasticated cuffs. Engelbert Strauss T-shirt Spider: High-quality and stylish logo shirt, available in 11 conbinations of colours, such as saphire/citrus, aqua/grey or black/graphite/grey. Very soft, highly comfortable material. Figure-hugging cut with short sleeves.